Female Clausocalanus jobei carrying an egg sac. Chaetoceros spp, an abundant centric diatom found in the marine environment that is capable of fixing carbon. Photo by Rachel Parsons. Styliola subula, a common winter species found near Bermuda. Photo by Amy Maas. 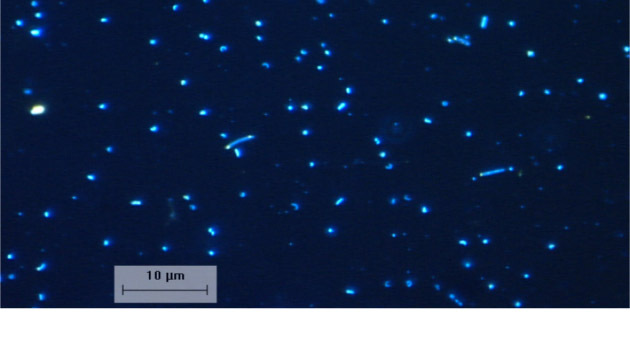 Bacterioplankton from surface waters at BATS that have been stained with a DNA binding stain DAPI and fluoresce under UV light. Photo by Rachel Parsons. Cavolinia gibbosa, a large warm water species occasionally found in Bermuda during the summer. Photo by Amy Maas. The open ocean, and the Sargasso Sea in particular, is home to a diverse collection of organisms. 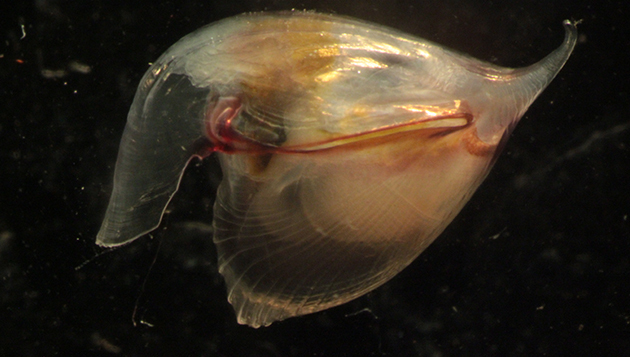 Many are too small to swim against the ocean currents – these are the plankton. Ongoing research at BIOS seeks to understand these species, which include viruses, bacteria, archaea, protists and animals, and to detail their role in marine ecosystems. 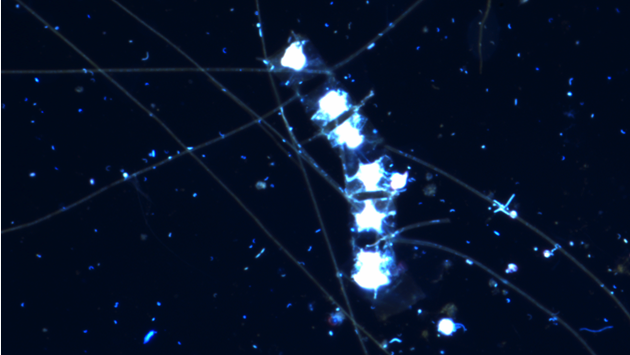 Even though they are too small to see with the naked eye, microbes (or micro-organisms) dominate the ocean, and indeed all of Earth. Marine microbes influence the biology and chemistry of the ocean, and thereby the entire food web as well as the ocean’s climate-related biochemical cycles. Microbial oceanography is a rapidly evolving field, and BIOS-SCOPE aims to make significant research advances in our scientific understanding. This five-year multi-institutional research collaboration leverages the Bermuda Atlantic Time-series Study (BATS) and its associated research as well as BIOS’s capabilities via the Microbial Ecology Laboratory. The Microbial Ecology Laboratory focuses on the cell biology and biogeochemical activities of major microbial groups within the open-ocean and coastal environments around Bermuda. Projects include viral dynamics within the Sargasso Sea, the response of microbial communities to low oxygen within a seasonally anoxic sound, the response of microbial communities to anthropogenic sources and how corals and microbes interact BIOS-SCOPE also links the larger planktonic organisms into our understanding these microbial processes via collaborations with the zooplankton ecology and invertebrate physiology labs. 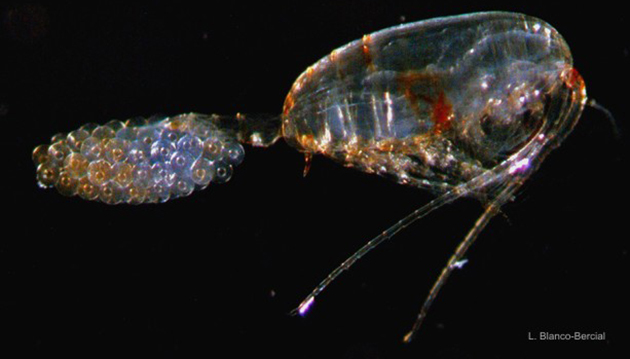 Work on the larger organisms, in particular the zooplankton, is focused on elucidating the ever-changing composition and function of these small marine animals in the ocean’s ecosystems and biochemistry. Using molecular biology and visual machine learning technology, the Zooplankton Ecology Lab is expanding our understanding of biodiversity in the plankton. Current projects include describing the endemic cave fauna of Bermuda, documenting the biodiversity in the Sargasso, and helping to shed light on organisms inhabiting the twilight zone of the oceans. The Invertebrate Physiology Lab explores how the function of marine invertebrates is modified by their environment, using experimental analyses of animal response to various cues, such as changing temperature, daily cycle, carbon dioxide or oxygen level. 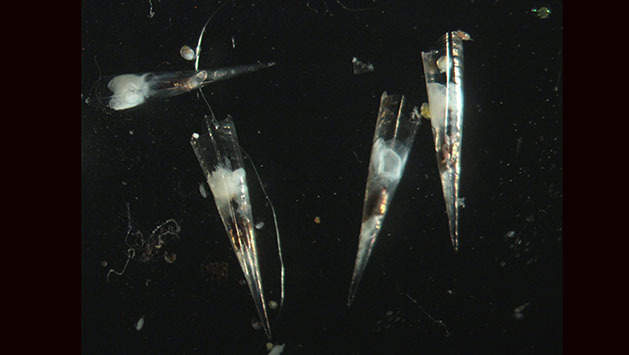 With a major focus on zooplankton such as copepods, krill and pteropods, these analyses are then linked into the BIOS time series, distributional and biodiversity studies, to quantify how changing conditions influence the ocean’s biochemistry.